Most Hajim School students have their hands full working on one senior design project. Sean Reid, an optical engineering major, is working on two --- and even considered three at one point. “This semester has involved a lot of reflecting on who I am, where my career can go, and what I can do – what my limits are,” says Reid. He’s also learning about the dynamics of working on a team – in this case with two teams involving a total of 10 other students – and how a team comes to consensus on the tradeoffs that have to occur to meet project specifications under the pressures of a deadline. The goal of the pathogen detector is to use a technique known as Brewster Angle Straddle Interferometry to create an inexpensive, portable device that a farmer, for example, could carry into a field where there are diseased plants. The farmer would rub some of the diseased plant material on a slide, insert it in the device, which would use polarized light from an LED to determine if pathogens were present. The device would then provide a readout alerting the farmer whether his plants needed to be quarantined. And that, no doubt, will serve Reid well when he embarks on his engineering career after graduating in May. He’s weighing two job offers, one from an optics company in Manchester, N.H., and another from a company in Seattle. In the meantime, he is also preparing to give a talk at Lawrence Livermore National Lab last this month on yet another project he’s been working on for the Laboratory for Laser Energetics. 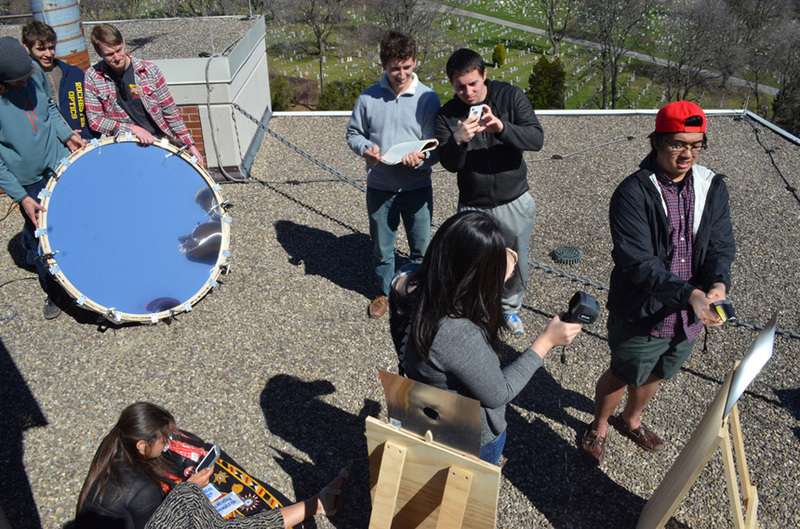 The Solar Concentrator project, which seeks to improve upon an initial design by Optics Prof. Wayne Knox, involves both optical and mechanical engineering seniors. 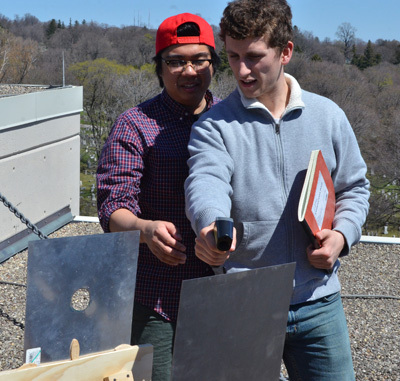 During the experiment above on the rooftop of Wilmot Building Jacob Blacksberg of MechE and Daniel Morgen and Michael Dupuis of Optics aim the concentrator, while Reid and Bryan Maas of Optics write down readings and observe. Henry Pablo of MechE aims an infrared thermometer and Fifi Song of Optics aims a thermal camera to document how quickly the concentrator heats its target. Michal Adar of MechE, seated, times the observations.